[SatNews] ... the unit will automatically deploy, lock to the satellite and connect to the Internet and/or private voice and data networks as required within five minutes. A top-tier oilfield service company which is delivering its advanced well services to assist in the development of tight gas resources in the Cooper Basin, Australia, is using “Hermes Connect,” the latest wireless VSAT solution. Hermes Connect is a skid-mounted system which delivers rapid deployment and offers high-availability connections in a portable package, with the added benefit of lower deployment costs and reduced bandwidth costs. The unit is totally self-contained, with no requirement for a separate indoor unit, and with a local wireless access built in as well as data cable connection points. Once the power supply is connected, the unit will automatically deploy, lock to the satellite and connect to the Internet and/or private voice and data networks as required within five minutes. Hermes Datacommunications Ltd specializes in providing Wide Area Communications to the upstream oil and gas industry worldwide, with over 20 years of experience, service in 54 countries, representing 92 percent of the world’s oil and gas reserves. 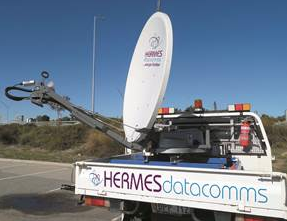 Hermes Datacomms provides satellite and fiber links to some of the most remote and challenging locations, both onshore and offshore. Solutions are tailored specifically to the oil and gas industry and include international connections, managed networks and oilfield infrastructure.